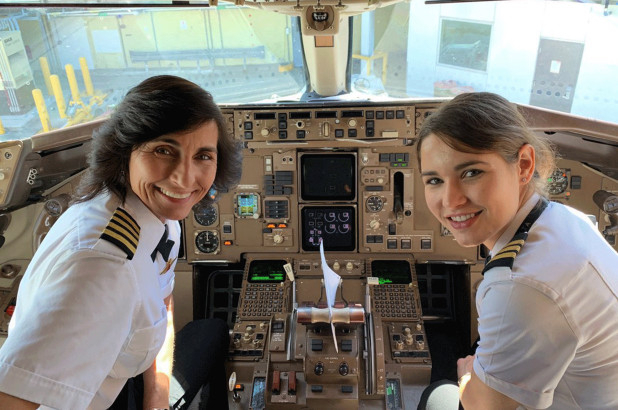 Dubai: It’s not every day that a mother-and-daughter team fly a passenger aircraft together. But that’s what happened when a passenger discovered before departure that two women, identified as Capt. Wendy Rexon and First Officer Kelly Rexon, were about to fly a Delta aircraft from Los Angeles to Atlanta. The passenger took snaps of the Rexons on the flight deck before the LA-to-Atlanta flight, and posted it on Twitter. Their phenomenal social media renown was a bit of a fluke: A woman had asked a flight attendant if her two kids could go to the flight deck. The flight attendant gave them permission, and told her they would be "surprised." The attendant’s comment drew the attention of another passenger, Dr. John R. Watret, a chancellor of Embry-Riddle Worldwide, an aeronautical university, who overheard the children mention a mother-and-daughter flight crew when they returned. He Watret, a chancellor of Embry-Riddle Worldwide, an aeronautical university, also asked for permission to visit the cockpit and was allowed by the attendant. It's indeed rare to have even one woman as a pilot — let alone two — in the US, where only 7 per cent of US FAA-certified pilots were women. And for the Rexons, it’s all in the family. Kelly’s sister is a pilot too. Dr Watret’s tweet has since gone viral, with tens of thousands of likes. It was an inspiring moment for Watret too, who advocates for more diversity in aeronautics. Only about 7 percent of over 600,000 pilots certified by the US FAA, are female, based on the 2018 Active Civil Airmen Statistics. Watret stated his school has made a commitment to creating more opportunities for women in aviation. It’s not clear, however, what aircraft the mother-daughter duo was flying and how often they are assigned by Delta to command the plane together. It’s also not clear if, as the mom and daughter flew the plane, the dad and son are passengers.